This is the time of year when harvest is in full swing with swathers, combines, trucks and other machinery dotting the farm landscape. It was not that long ago when harvest had an entirely different thrust than it does today. Harvest was a time of gathering food to be stored for the winter so families could survive until the next summer when new foodstuffs would be available. Harvest included much more than the threshing of crops. It included: gathering and storing vegetables from gardens, picking and preserving fruit, collecting and drying mushrooms plus many more. These particular activities were essentially the domain of women and children. The men on the other hand would be responsible for providing meat by hunting and fishing. While some of the meat was eaten when fresh most would be dried into a kind of jerky (pemmican by First Nations for example) or made into a variety of sausages all of which would not spoil for a long time. The tradition of hunting for meat still continues to this day when people legally hunt game birds such as ducks, geese, cranes and so on. One game bird that used to be very common but recently has declined dramatically is the American Pintail Duck. In the 1950s it was one of the most common of ducks with every slough seemingly having a nesting pair or two. Nowadays one will usually see some in the spring and fall but rarely in the summer. Efforts have been made by organizations like Ducks Unlimited to help the species recover but progress has been slow. To further help the Pintails hunting limits have been severely restricted. The Pintail is a Mallard sized duck but much more streamlined and slender with a rather long slim neck giving it a swan-like appearance. The drake is rather striking with the white on the upper breast and neck leading to a distinct point on the side of its brown head. The body is grey with some black on the wings and near the tail. The tail has elongated feathers that reminded people of a straight pin hence the name, Pintail. The drake Pintail is not brightly coloured but he does look dapper as he were going to some formal affair. The hen is a drab mottled brown. This week's picture was taken at the Batiquitos Lagoon in Carlsbad, CA where many ducks winter. Because these waters are protected the ducks become quite confiding and can be approached closely for good photos. In addition, the ducks have usually moulted into their spring plumage and the colours are very vibrant adding to the quality of the photos. 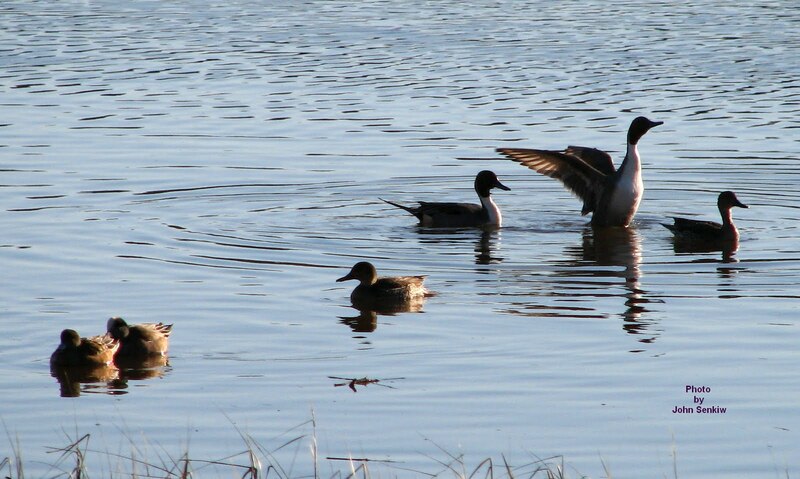 This week's photo shows two pairs of Pintails and a pair of Widgeons in the left foreground.